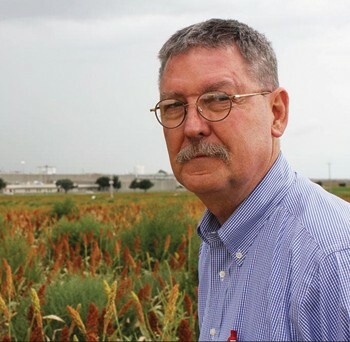 Don Stull is professor emeritus of anthropology at the University of Kansas and coauthor of Slaughterhouse Blues: The Meat and Poultry Industry of North America. 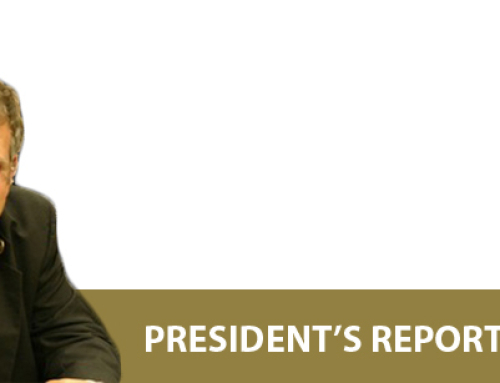 He is member of the Kansas Farmers Union, Vice President of the Organization for Competitive Markets, and on the board of directors of the Socially Responsible Agriculture Project. Fueled by steady increases in domestic consumption and exports, poultry companies are increasing production and expanding into new territories. One of those may be Kansas. On September 5, 2017, Tyson Foods announced plans to build a $320 million plant in Tonganoxie, which when completed in 2019 would process 1.25 million chickens a week. Why did Tyson pick Tonganoxie for the first new chicken plant it will build from the ground up since 1996, when it opened its Union City plant in northwest Tennessee? Here is what I think. Tonganoxie is a small-town, there is plenty of grain and water in the area, environmental and zoning restrictions are limited, and it has easy access to interstate highways—all of which meat and poultry companies look for when they select a new site. But Tonganoxie’s economy is not declining—and, even more unusual, it is close to a metropolitan area and several sizeable cities. Large meat and poultry companies always say they want to hire locals to work in their plants, but they know that given the size of their workforces and high turnover rates, they will soon exhaust local labor pools. You do not need to speak English, have a high school diploma, or previous experience to work on a packinghouse floor. This helps explain why today’s meat and poultry industry relies heavily on immigrants and refugees. Plant managers are usually white males; office staff are often white females. Out on the floor, it is a different story: Mexicans and Guatemalans “pull their count” beside Somalis, Burmese, Marshall Islanders, and other immigrant and native-born workers. But the labor landscape may be changing for meat and poultry processing. The Trump administration wants to severely reduce the numbers of immigrants and refugees admitted to the United States (according to a September 28, 2017, CBS News report, it is capping refugee admissions at 45,000 for 2018, down from 110,000 in 2017). Communities are often seduced by meat and poultry companies’ description of their jobs as “good-paying.” Some are. But 90 percent of workers in meat and poultry plants are hourly line workers, whose wages are below or barely above the poverty line. Tyson says “hourly wages will range from $13 to $15 per hour with some skilled labor jobs paying more than $20 per hour.” But it also speaks of people looking for jobs in the $10-$15 hour range. At $10/hour, working 40 hours a week, 52 weeks a year, an hourly employee would gross before taxes and withholding $400 a week, $20,800 a year. This is $3,800 below the federal poverty level for a family of 4 ($24,600). At $13/hour, the annual gross income would be $27,040–less than $3,000 above the federal poverty level. At $15/hour, annual income would be $31,200, only 127% of the federal poverty level; and at $20/hour, annual gross income is $41,600. That sounds pretty good, but it is only 169% of the poverty line. And remember these are gross wages. Assuming a household size of 4, the children of Tyson workers making $15/an hour or less would be eligible for free school meals ($31,960), and even children of those making $20 would be eligible for reduced-price meals in public schools ($45,510). 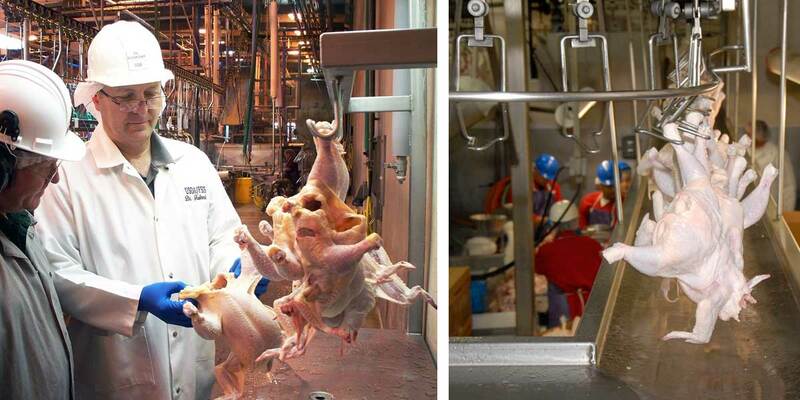 Most hourly jobs in a meat or poultry plant don’t pay well. They are also dangerous. The Government Accounting Office found that in 2013, meat and poultry workers suffered the highest incidence of total illness cases of all industries in the United States. The illness rate for meat and poultry workers was 4.4 times that for manufacturing workers overall. And under reporting illness and injury is commonplace in packinghouses. The Tonganoxie plant is projected to slaughter 1.25 million birds a week—65 million a year. For every pound of gain, a chicken produces half a pound of dry waste. This waste, combined with the rice hulls or wood chips used to line the floors of chicken houses, is called litter. Grown to a weight of 6 pounds, 65 million birds would generate 195 million pounds of litter a year. All this waste gets spread on cropland as fertilizer–at four tons per acre, the recommended rate, this litter will fertilize 24,275 acres, or 38 square miles of Kansas every year (640 acres = 1 square mile). Chicken litter is an excellent fertilizer, but if applied at levels above the nutrient absorption rates of soils and crops, runoff and subsequent ground and surface water pollution will occur. Air pollution will also be an issue. In 2007, an Iowa State University study found that two western Kentucky chicken houses emitted over 10 tons of ammonia in one year—levels sufficient to cause respiratory harm. Tyson contracts with some 4,000 of what it calls “independent farmers” to grow chickens in the United States. Poultry companies like to say that they and their growers are financial partners in the poultry industry. Each side does put up about half the capital necessary to support the industry, but the relationship is far from equal. The company owns not only the birds, but the genetic patent on them. It owns the feed, medicine, trucks used to bring feed to the grower and haul his birds to its slaughter facility, and the brand under which they are marketed. 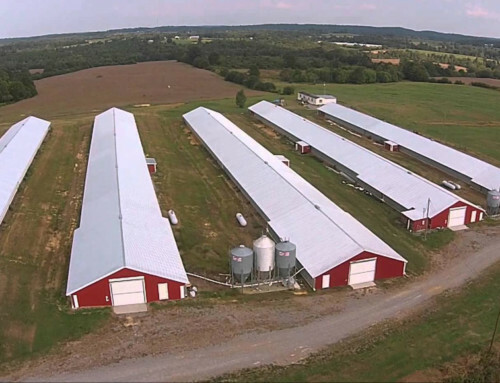 The grower owns the farm, the chicken houses, and the considerable debt incurred to finance, maintain, and upgrade them. The grower must provide the labor necessary to raise the birds, pay for water and utilities, and dispose of their manure and any birds that die in his care. Growers are compensated according to what economists call a “tournament pay system.” Tyson sets the base price per pound live weight, then makes adjustments in pay according to performance, judged by feed conversion and death loss. In this tournament, each grower is ranked in an ordinal scale against all others whose birds are slaughtered at the same plant in the same week, and his pay is adjusted accordingly. Growers are compensated only for those birds that reach the processing plant. But growers are not present when the birds are weighed and cannot challenge head counts, weights, death loss, or their ranking within the tournament that determines the amount of payment per pound. Growers have little recourse in disputes with companies, and stories of abuse and intimidation abound. The company can send you sick birds or “short” flocks; it can “short” you on feed or “short weigh” your birds when they are delivered for slaughter; it can keep your birds waiting at the processing plant scales so that they lose weight and you lose money; it can require you to make costly upgrades to your houses; it can mandate resolution of disputes through arbitration and require you to sign away your rights to sue. And if you challenge the company, it can cancel your contract. In 2001, a study by the National Contract Poultry Growers Association and the U.S. Department of Agriculture found that 71 percent of all growers’ whose income came solely from chicken production lived below the federal poverty line. A 2014 USDA report found that in 2011, nearly a fifth of large grower operations (5 or more houses) and nearly a third of smaller ones (1-2 houses) had negative net farm income—more than 20 percent of the smallest poultry farms and almost 10 percent of larger farms failed to cover cash expenses. Northeast Kansas hasn’t been exposed industrial chicken production, and this was probably another reason why Tyson wanted to build its new plant there. At the September 5 press conference announcing the project, Governor Brownback touted “the far-reaching impact of this development [that] will be felt by farmers, ranchers, agri-businesses and communities throughout eastern Kansas.” Neither the governor nor Tyson officials were prepared for the groundswell of opposition that quickly emerged to the proposed plant. Rather than naively swallowing Tyson’s rosy projections, several thousand people from northeast Kansas gathered in Tonganoxie’s Chieftain Park on two occasions to vigorously oppose the plant. 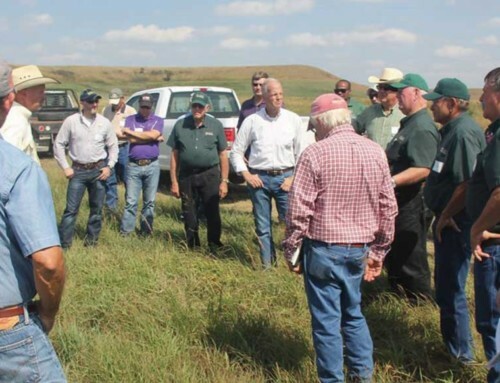 They were, in fact, quite well informed of the “far-reaching impact” the Tyson plant would have for farmers, ranchers, communities—and the environment–throughout eastern Kansas—and they wanted none of it. In response to vigorous community opposition, on September 18, the Leavenworth County Commission backed out of a “resolution of intent” to issue $500 million in industrial revenue bonds to Tyson to build its plant on the outskirts of Tonganoxie. The bonds would have made the facility eligible for an 80 percent property tax abatement for 10 years. Without the promise of half a billion dollars in revenue bonds, Tyson put plans to build in Tonganoxie on hold and began considering other locations. As of September 20, 16 Kansas have shown an interest in the plant. Tyson has reportedly narrowed the list to three locales—Concordia in Cloud County, Coffeyville in Montgomery County, and Sedgwick County. 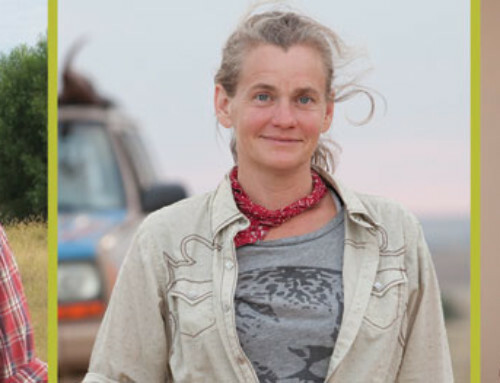 I am an enthusiastic meat eater, and the meat I so enjoy must come from somewhere. 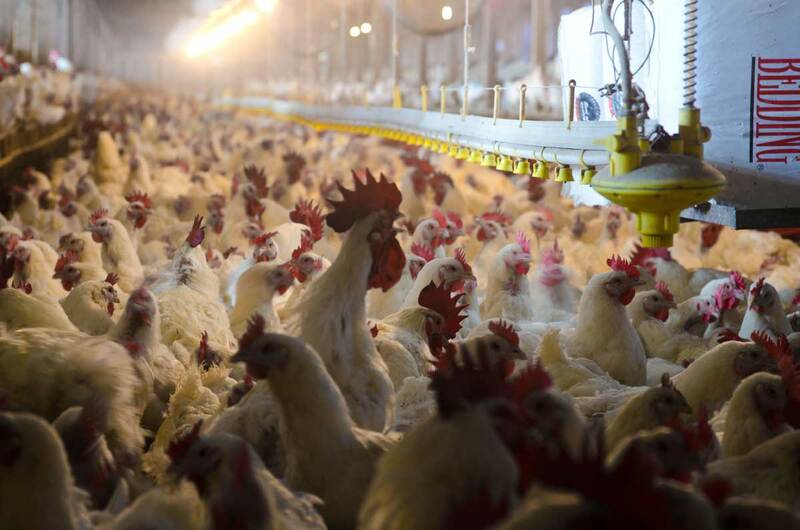 But the system of chicken production and processing as practiced by Tyson and other major poultry integrators creates serious problems for the environment, as well as for growers, processing workers, and the communities where plants are located. Whether you are considering growing birds for Tyson, or whether you live in an area being considered for the new plant, you should ask Tyson some hard questions—and get some concrete answers. And you should ask state and local officials–and yourselves–whether this is the kind of economic development that will create a better economic, social, and physical environment for the people of Kansas.